Having cut my hand and bled over the vegetables one time too many, I decided that it was time to invest in a good quality knife set. I did a bit of research, both in the local stores and online - and in the end I chose the Zwilling J.A. 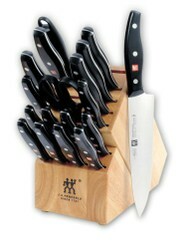 Henckels Twin Signature 19-Piece Knife Set with Block. What Makes a Good Quality Knife Set? You can actually feel the difference with a good knife. Cooking in the kitchen with this knife set really made my life a lot easier. This is what I have experienced ever since I started using this knife set. I no longer have to spend a lot of time cutting through meat and slicing fruits and vegetables. This knife set is truly a work of art. The Zwilling J.A. 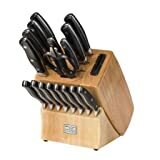 Henckels Twin Signature 19-Piece Knife Set with Block is made in Germany. 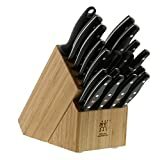 Most of us would know that when it comes to knife sets; the best ones would be made from Germany! Knives made in Germany would be of the highest and exceptional quality are and are known to use exception quality stainless steel for their knives. A good quality kitchen knife set is both durable and really sharp. This knife set is even covered with a lifetime warranty. This would just show how good the product is because the company is confident with their knife set. Since I started using the Zwilling J.A. Henckels Twin Signature 19-Piece Knife Set, I never wanted to hold another set of knives with my hands again. Now I know how professional chefs who use this product feel when they cook in their kitchen. The Zwilling J.A. Henckels Twin Signature 19-Piece Knife Set are knives that are Friodur ice hardened. This is a trademark of the company in order to strengthen their knife blades. This literally means that the steel is ice-hardened in order for it to attain maximum blade strength and to prolong its sharpness like no other. The knive’s handles also feature the three rivets and a visible full tang. This would allow the user to hold and grip the knife firmly. They are also curved stylishly so they would look and feel good. The company also embedded their Zwilling logo on one side permanently. This gives a spot of color on the products. The blades of their knives are also made from no-stain high-carbon steel. The edges are laser sharpened which allows the knives to have a more durable edge. This is the reason why these knives can really accomplish any cutting jobs that they are used with. These knives also do not have any bolsters; they are stamped and this makes them lighter than other brands of knives. The 19-piece Zwilling J.A. Henckels knife set has definitely all the kinds of knives that a chef would ever need. The set would include a 2.5 inch peeler, a 4 inch parer, 4.5 inch utility, 8 inch bread knife, 5 inch serrated utility knife, 6 inch utility, a 7 inch santoku hollow edge, an 8 inch chef knife, and 8 steak knives. These knives are also dishwasher friendly so people who have no time of washing them or are busy with other things in the house can clean their knives while working on something else. However, it is advisable that people clean their knives immediately after use and then dry them up for best results. Zwilling J.A. Henckels Twin Signature 19-piece knife set with block is Friodur ice-hardened in order for the blades to attain maximum strength and lasting sharpness. They are made from high carbon stainless steel blades. They are not just good in doing their cutting job but would also look and feel good with their three rivets and a full tang. These are also dishwasher friendly and are manufactured in Germany. Broan Range Hoods Reviews - here's why you should chose Broan Range Hood parts for your next kitchen range hood. Not all rice cookers are equal - the Zojirushi range of rice cookers are some of the best quality rice cookers available. Good post. It seems to be a good idea to take advantage of a quality set of knives in the event that your old set is worn out. Thanks for sharing.